“Jesus, thank you for everything that we will celebrate tomorrow. Easter kind of snuck up on me and my secret plan was to let it pass without explanation. They’re just beginning to know this Jesus and honestly I was just a little overwhelmed with all of the new. But this week I flipped ahead in our Jesus Storybook Bible to the pages of Easter week and read (tonight through tears) Sally’s translation of the story for little ears and hearts. They absorbed it so beautifully and as we’ve participated in egg hunts and waded through the myriad of bunny-themed paraphernalia at Target, they’ve been the ones to remind me of the real reason we celebrate this week. They are, after all, just 6 months away from their own Easter-style story. They remember what it’s like to live like an orphan and for someone to travel far to make them a part of a family. This holiday where we celebrate God’s sacrifice to bring us into His family is far more fascinating to them than candy (although it delights me to watch them enjoy it). Children are primed for truth – their hearts long for it and recognize it far more easily than I do, with my adult-sized expectations and culture-jaded parameters for what is or should be or probably won’t happen. I was worried that the egg hunts and bunnies and pastel candy would somehow captivate them more than the Truth, but it turns out that children are much better judges of what is truly captivating – a Rescue Story. In the midst of it all, they picked out what they thought was the best story – and they chose well. I’m learning that I don’t have to hide the world from my children in order for them to really know and treasure Jesus, I just have to tell them the best Story and it will resonate in a way that allows them to eat candy and hunt delightedly for eggs, while deeply knowing the One who gives these good things and is passionately pursuing their hearts, too. The mail came just as we were walking out the door, in it a surprise package for the girls. Tearing into the paper, they found crayons and coloring books and one precious item that Emma immediately grabbed. “I snuggle with this in the car,” she announced. The 45 minute drive to a friend’s house was quiet as she admired her treasure. To a child whose life has afforded very little to call her own, anything given directly to her holds deep value. We walked into the house where she was meeting our new-to-her friends and within minutes, I saw her place the treasure in her new friend’s hand and say, “This for you.” Less than an hour of ownership and she was already generously giving this treasure away to a stranger. I’m embarrassed to admit that part of me wanted to jump to her rescue and assure her that she did not have to give anything away, but who wants to adjust that level of generosity? I say that I want a culture of generosity in our home, but I can learn so much from these girls. Not two hours later, the little girls reappeared from their games and loom band bracelet creations, Emma carrying a tiny gold necklace and glowing like she was carrying the moon. One of her new friends had returned her generosity 10-fold. And I had to wonder, what security do these little girls know that allows such radical (in their economy) giving? They give without second guessing, without wondering how it will be received or whether they might regret it tomorrow. Could it be that they have watched the goodness and regular provision of their parents and realized that no matter how much they give away, there is a steady stream of both calculated and extravagant goodness that flows their way? No, she’ll probably never get a replica of that little popsicle stick flower that she loved and her friend will probably never get another bumble bee necklace exactly like the one she gave, but they have a child-like trust that they are loved and that whatever happens, the people who love them are working for their good. Even for the former orphans living in my home, empty is becoming less about fear and more about getting to watch Mommy fill the bowl again…and again. And their mama who wanted to stop all this giving and just let them keep what was theirs? That’s because lack is scary to me these days. I wonder how I’ll provide for them financially and still find time for their hearts. I second guess a family trip and a birthday gift, wondering if what was given should have been saved instead. Of course there’s wisdom in saving, but this little note isn’t for the extravagant spenders. It’s for the savers, like me, who hold back what could easily be given and make that into a habit of holding onto everything. Would my level of generosity be dramatically changed if I truly believed that God would provide everything I need – especially if I give it away? What would I freely give away if I truly believed that He would not allow me to suffer any level of lack that was outside of His loving plan for my good and my heart’s health? Seeing Emma hand over her little trinket stirred up so much love in me and all I wanted to do in that moment was take her to Target and buy her all.the.things. I’m so grateful God allowed me to watch and feel the delight of a parent when their child truly rests in provision, so much so that giving becomes a complete joy and not a threat of lack. Because when you’re truly trusting, not only do you feel secure in what you have, but also in what you give away. **Yes, I know that so many are generous without any assurance of future provision. I want to be like them, too, but for today, my take-away is that I DO have a Father who promises to provide – not always in my timing or my plan, but always just the same. God is good, nothing is impossible, Jesus already won, and everyone is important. Immediately, I wrote them down, knowing that one day I would want to teach them to my children. Little did I know at the time, however, that these words (and the ones that followed them) would turn into a lifeline, not just for my children, but for me. The struggle to keep lies out of my head has been lifelong. I can remember lying in bed as young as 4 and 5 years old and trying to shut out lies: you’re not safe, people don’t like you, you’re a bad friend, tomorrow will be a bad day. Somehow, over the years, I learned to repeat truth to myself over and over and prevent, early, what I assume could have turned into truly crippling fear. Enter this adoption. As a single woman. In a country where fear has captured generations. Of two children who knew fear intimately. As much as the desire of my heart is to show my children that I am safe, my own fears and the very reality that nothing about life is really safe led me to realize that the only way to truly make my children feel safe was to introduce them to Safety….Himself. Not necessarily a promise of physical safety, but of an intimate relationship with a God who guards hearts and minds. So many friends have asked me to put the true words up here so they can begin using them with their own kids, so here they are….finally. Click on the picture below to access the PDF download. To purchase a True Words print, click here. Tonight the girls and I made a winter storm sanity escape to Chick-fil-A. We rushed in from the cold to a restaurant transformed. Pairs of daddies and daughters dressed up in their finest sat around pink tables topped with heart confetti. My heart sank as I watched the girls assess the situation. Every little girl in this room had a daddy. We have a new friend at this branch and she quickly found us a table – nestled there among all of the suits and ties and frilly dresses. We were admittedly out of place, but welcome. I truly believe that there is nothing “wrong” with our situation right now. Not having a daddy is an important part of our story for now, for some reason. It is shaping us and nothing is wasted if it can be used to show us something new about our God. I’m sure that His plan for me and the girls will be made more perfect because we’ve experienced this season, but in moments like this Valentine’s Day date, it stings a bit. Yet. It’s the word I try to use when talking about being a single mom. I’m a single mom for now. Don’t monogram that, please. Our last initial is changing one of these days. Of course, I don’t know if it will happen, but hope – in anything risky – scoots me right up next to the God who calls Himself the God of hope and doesn’t give us permission to let go of dreams in order to feel safe. Tonight could have been a dreary reminder of all that this holiday means to a single girl + the added pressure of making it special for my little girls. But the God of redemption doesn’t call us His own and stop there. He wants each and every inch of our hearts to be His own. He wants to redeem our dreary minutes and our Valentines Days and our laundry folding and our errand running. No thing is too insignificant OR too big for Him to make new. He wanted to be our Valentine tonight and I’m pretty sure this was a date we’ll remember. And let’s be real. There will never be a time in my life or yours when we’re not aware of something missing. It could be that as we look for this God who fills in the missing places in our lives, we will discover that often what is missing is actually a doorway through which He is inviting us to something better than anything we ever missed. If you’re not sure how to find Him or where to start looking, I’d invite you to follow my friend Sara over on Instagram (@everybitterthingissweet). We’re posting daily, bite-sized, glimpses of who He is. They’re short enough to read in the carpool line or while you’re stirring mac ‘n cheese. When I was 21 years old, my prayers for my future children began to take shape. It was as if I knew they were already alive, not necessarily waiting for me yet, but growing up in their own places and living their lives apart from mine for a season. That year, I began to pray for the children who would join my family in the future, realizing that they could be currently living through the circumstances that would create a need for adoption in the future. That’s a scary thought, knowing that your future child could be living through trauma and not being able to prevent or alleviate the circumstances. The surprise of my life this whirlwind winter has been meeting the child who was born that year – the year I began praying for her without ever dreaming she was growing up in Africa. A few years later, her sister was born. My prayers had always been for them, so I should not have been surprised when even our first hours together showed evidence of God’s work in their hearts and mine long before we knew about each other. But as this adoption took shape, so did my fears. I was afraid that they wouldn’t trust me, afraid that we wouldn’t be able to communicate, afraid that our attachment would take years. Normally, fear cripples me, but during that season I drove a friend’s car and listened to her CD about how God is a builder. It seemed weird to think He could build intangible things like positive emotions, trust, and attachments, but surely those things are easier to build than an atom or an ecosystem? My fears shaped my prayers as I asked Him to build a structure for safety and attachment in my girls before we even met. I asked Him to redirect their neural pathways, allowing them to bypass the things that had once caused fear and insecurity and immediately build trust with me. Obviously, we’re only a few months into this adventure, but almost daily I see evidence that my prayers were answered in amazing ways. The child who, according to adults who knew her well, was terrified of light-colored skin walked across a busy parking lot to put her hand in mine, long before she knew I was her mama. She found safety in me, a stranger who did not even speak her language. The little girl who hung back, timid, and described herself as the one who “always kept quiet” when others took her things and teased her suddenly began to describe her feelings with beautiful language that brings tears to my eyes. As this beauty has unfolded, I’ve had to wonder if Jesus has been praying for me, His daughter – praying that my attachment to Him would be secure, that I would not respond to Him out of old wounds and habits, that God would build in me everything necessary to enjoy life as His daughter. I don’t know what God did to prepare my daughters’ hearts for me, but I wonder if this adoption – and so many other uncertain moments of my life – has been the deliberate and gracious action of a God who is building something new in me just as He is doing in my children (the two in my arms and the ones I don’t yet know). We’re still just inching our way towards healing over here and not every day is easy, but the road feels as if it has been paved by a God who delights in showing off just how much He can do when we stop to ask. What impossible are you asking Him to build this year? 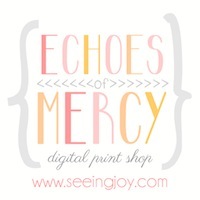 © 2012 :: Mandie Joy [Echoes of Mercy]|ProPhoto Photography Theme | Designed by That's Kinda Cool!